Prevents limescale that harbours germs. Continuously fragrance. Hygienic application. Cleans with each flush. Long lasting up to 8 weeks.Did you know that traditional Toilet rimblocks can harbour germs? Duck Fresh Discs Cageless Toilet Rimblock is a gel base formula that self-sticks to the toilet bowl so you don't have to worry about germy cages. Its powerful and smart formula activates with every flush leaving a protective shield all around the toilet bowl ? preventing limescale and stains that harbour germs. Simply self-stick to the inside of your toilet to keep it clean and fresh with every flush. Try Duck, makes a tough job easy! DIRECTIONS FOR USE - Ensure the toilet is clean 1. Align large button on gel holder with holes on handle. Remove cap and keep. 2. Position clear end of gel holder against inside surface of bowl where water will flow when flushed. 3. Press and hold button whilst pushing dispenser against bowl until button clicks. 4. 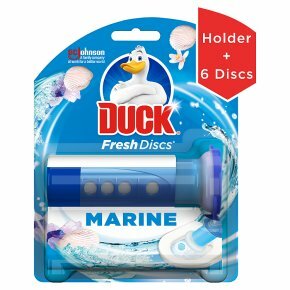 Pull dispenser straight back to leave a gel disc. Replace cap tightly. Flush toilet to activate gel disc. After application, disc may be attractive to young children. Use product in an area least visible by children. Suitable for septic tanks. 5. After dispensing the last gel disc, twist the gel holder slightly and remove from dispenser. Keep handle for refill.